What is multi-factor authentication and SAASPASS? Most multi-factor services send you an automated digit codes via email or sms which you use after you’ve entered your password. SAASPASS allows you to enable multi-factor authentication with a QR code which is by far the superior multi-factor authentication method. SAASPASS is available for free download on both the Android and Apple app stores. After you download the app you will need to enter a four-digit pin. Be sure to remember this pin, because if you forget it you’ll be permanently locked out of your account. The next step is to link the apps you want to enable multi-factor authentication on. The app must support multi-factor authentication and thankfully the vast majority of the most popular apps support this feature. Facebook has a straightforward process in enabling its multi-factor authentication feature. Simply go to your settings page, select security and login, and then underneath the two-factor authentication section you can enable the SAASPASS QR scanner by selecting third party app. Then, with the QR scanner at the top of the SAASPASS app you can hold the camera to take a picture of the QR code, and you’re linked. QR codes are much more secure than passwords or verification codes sent by email or text message. If an app doesn’t allow for multi-factor authentication, seriously consider whether it’s worth using a service that doesn’t provide comprehensive cyber security. This type of security is set to become even more commonplace, so learning how to use it and knowing the apps that have stayed ahead of their competition will help you in the years to come. SAASPASS isn’t only a QR scanner. It works as a password manager, account authenticator and storage of secure notes. You’re also able to securely unlock your personal computers with a QR code. Be careful though when installing SAASPASS onto your personal computer and double check if your system supports the service. SAASPASS can also secure your web browser by downloading the software extension. SAASPASS also offers affordable services for all types and sizes of businesses. Included in the packages is ongoing tech support and cloud storage to further backup all your security. Having secure backups significantly reduces the risk of being permanently locked out of your accounts, which can be disastrous for many businesses. The more secure an account becomes, the more commonplace the possibility of being permanently locked out of your account. Unfortunately, that is just the reality of security software today. Many apps allow for emergency situations in case you lose your phone or leave it behind on a long trip. 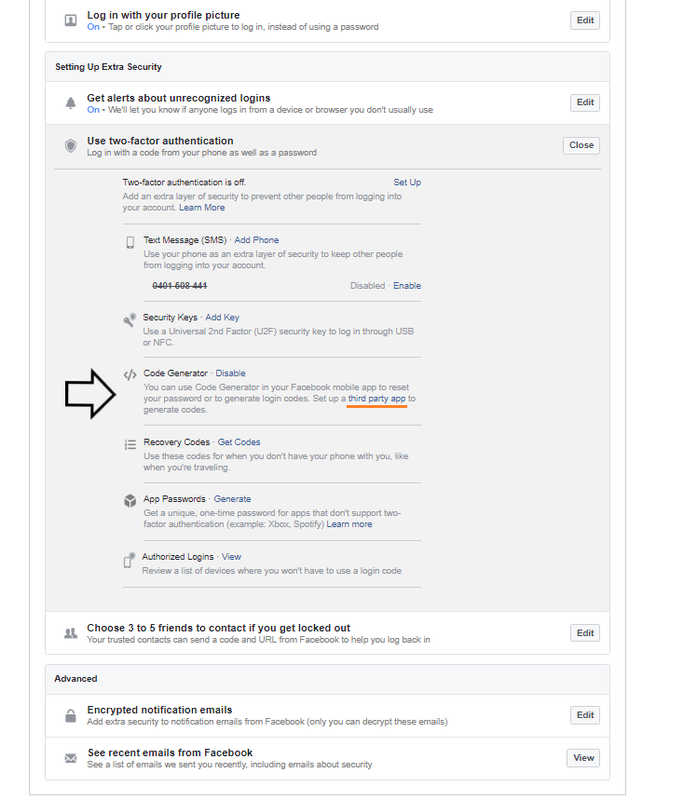 Facebook, for example, lets you nominate three trusted contacts to securely login in on your behalf if you ever have difficulty accessing your account. Backing up your data and security is the best policy in today’s digital age, and will save a lot of time if you ever have to set up a new account. Despite the risk of permanently being locked out of your account, multi-factor authentication is still critical for keeping all your accounts and information secure. Privacy has never been harder to protect than it is today, but SAASPASS allows you to have peace-of-mind while using the internet.